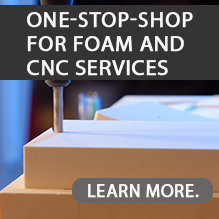 The LAST-A-FOAM® FR-3800 FST is a halogen-free polyurethane-based foam core material which complies with fire, smoke and toxicity (FST) requirements, and Ohio State University (OSU) 65/65 heat release standards for applications such as aerospace interiors. It is also compliant with the European Union’s REACH regulation. Used in conjunction with other materials, FR-3800 FST foam core helps improve aesthetics and reduces costs while meeting fire safety requirements. In most cases, these requirements apply to ceiling and wall panels or structures that cover large surface areas within the aircraft. This series is an excellent alternative to thermoplastics foams and honeycomb for core and structural applications. The panel configurations described below meet FST/OSU requirements which are defined as material testing below specified limits for peak heat release, total heat release, smoke density and toxicity. The table shows the average values obtained for heat release and smoke density for each respective configuration along with the specified limits shown in the top row. Download the FR-3800 FST Panel Configuration PDF. Table 1: Configurations are shown as layers upon its respective 3800 core material, which is 1/2″ thick. The opposing side of the core can either be the same as that shown (symmetrical), or consist of 38XX/CYCOM 2265/CYCOM 2265. CYCOM 2265 is a 7781 glass phenolic resin prepreg meeting BMS8-226, and AX-2150 is a low heat release modified phenolic adhesive film. FR-3800 FST is available in a wide range of densities (3 – 40 pcf), and sheet thickness of up to 28 inches. Custom sizes and thickness are also available.